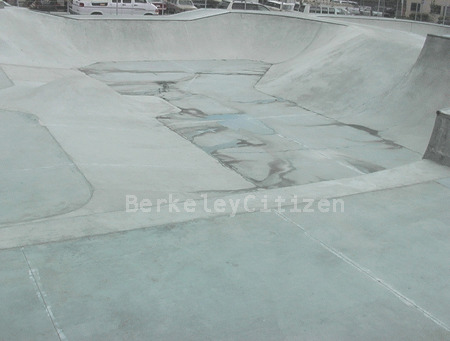 Last week, while breaking ground for the new city skateboard parks in West Berkeley, construction crews struck contaminated groundwater, and the site was shut down ("Toxins Found At Skate Park," Nov. 28). Who would have thought the Hollywood movie "Erin Brockovich" would play out in Berkeley! Yet lab tests have revealed the presence of hexavalent chromium (chromium 6) in the groundwater samples and the suspected source, a large toxic plume upgradient from the recreational site. It now appears that the city, which intended to buy a kid's soccer field, may also have purchased the long-term management of the area's chromium 6 plume. It does not take a hydrologist to understand this blunder, just a few facts and a little common sense. The ABCs of real estate say that before a property known to be contaminated is purchased, that either the buyer or seller requests a Phase One technical site review, which addresses off site concerns too. Such a study reduces the likelihood of being blindsided and stuck with the cleanup costs, such as those associated with the "newly" discovered toxic plume. In fact, no lending institution would commit to any industrial land purchase without a complete Phase One site study. The bank for the Harrison Street fields was the city itself. With no one else to fall back on, Berkeley will be forced to bear all the costs of what may become a $1 million cleanup. In the first week alone, remediation costs at the site have drained city coffers of nearly $200,000! Somehow, neither the UC Regents nor the city of Berkeley asked for a Phase One report. Certainly one of the city's excuses will be that it simply attempted to wear too many hats (owner, environmental regulator, developer, contractor and bank). With few checks and balances, the project was allowed to become more than a single poor choice, but a series of mistakes spanning back to the re-zoning of the site two years ago. If the zoning process had been conducted responsibly in l998, a complete Phase One would have been performed at the site, if only to legally affirm the assumptions put forth in the rezoning of the site for recreational use. Instead, the city, playing the anxious buyer, rushed in without a Phase One study and then raced through all of the city processes with little more in hand than a political directive to build this ball park in the industrial sector. Because of the extremely shallow groundwater levels and Codornices Creek bordering the soccer fields, it was necessary to install a dewatering system across the entire site, and especially at the skate park because of its structure. These drainage activities will draw the plume toward and into the Harrison Street site. Certainly, the site's water discharge points will need to be actively monitored. Moreover, the disruptions caused by the skate park's construction will accelerate this process as the structure itself becomes a conduit to the interior property. The upward migration of chromium 6 has now become a real concern. Undoubtedly, a proper site groundwater investigation would have prevented any below ground construction at the Harrison Street fields. Now, the city will have to fill in all the construction pits of the skate park and look to an above ground design -- if it is still convinced that this is the best place for our children. It never seems to fail that when a community like Berkeley discovers a serious groundwater problem, the Regional Water Quality Control Board says, "We make polluters pay!" It is time to tell the truth. Most often, when the pollution is owned by a small company, any attempt to require a cleanup usually results in bankruptcy. Therefore, the water board rarely makes any real demands for cleanup, as this longstanding chromium 6 groundwater plume clearly demonstrates, There has been no attempt to actively remediate this toxic plume. Instead, it has been allowed to spread off site for years. It is unlikely the city will recover anything from the regents for failure to disclose the off site chromium 6 since the city government was so thoroughly noticed, before, during and after the purchase, of the inadequate soil and groundwater review. This is government at its worst! An audit and investigation of the project and its rezoning should be demanded. Someone dropped the ball and it is time to find out who.